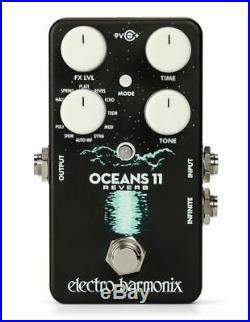 Electro-Harmonix Oceans 11 Multi Function Reverb Pedal. Mike and the team at Electro Harmonix do it again! Following the path they cleared with the Canyon Delay the new Oceans 11 Reverb has something for everyone in a compact pedal. From lush plate to classic kick the amp spring and shimmering organ sounds that will take you to church on Sunday. You can find it all here. This easy to use format makes this unit accessible to anyone from the cavedweller (ya we used dwell in a reverb pedal listing) to the space aged tone diplomat. Compact and ready to fit on your pedalboard right away. The Oceans 11s reverbs are. HALL the rich reverberant sound of a grand concert hall 2. SPRING pays homage to the classic Fender® 6G15 tube spring reverb 3. PLATE the lush, warm reverb that got its name because a large metal plate was originally used to create it 4. REVRS emulates the quirky reverse reverb effect where a notes reverb fades-in backwards. Jimmy Page claims to have invented it. ECHO sends a recirculating echo thru the Plate reverb. The crisp clear delays get tastefully smudged by the airy plate reverb 6. TREM reverb plus tremolo thats applied to both the wet and dry mix of a Hall reverb, your choice of three different tremolo shapes 7. MOD modulated reverb, three modes. Chorus laced onto the reverb tails creates a luscious atmospheric effect. Flanger wraps around the reverb tails and weaves a hypnotic tapestry. DYNA Swell, gate and duck. Swell silences your notes attacks before blooming the tails back into the soundscape. Gate passes the reverb tail thru a noise gate that opens when it detects playing. Phil Collins popularized the technique by applying it to drums. Duck compresses the reverb tail while youre playing and fades it back in when youre resting. AUTO-INF Auto-infinite reverb that triggers a reverb wash for each note or chord. When a new one is struck, the previously resounding reverb crossfades to the new one 10. SHIM Shimmer generates a rich octave-shifted reverb wash that modulates and blossoms behind your signal 11. POLY Polyphonic reverb, two configurable bi-directional pitch shifts operating on your pre-reverb signal. Combine dissonant intervals with near infinite decays to create disorienting soundtracks, or choose perfect/major intervals to generate creative harmonies when jumping around a key signature. The Oceans 11 features powerful, yet intuitive hidden parameters accessible thru its Secondary Knob Mode that let the player take greater control of its effects. An internal Tails switch also provides a choice of whether the reverb effect fades out naturally or stops immediately when the pedal is switched to bypass. In most settings the pedal is also capable of producing infinite reverb which can be played over with a fresh reverb effect complete with adjustable parameters! 11 different reverb types: HALL, SPRING, PLATE, REVRS, ECHO, TREM, MOD, DYNA, AUTO-INF, SHIM and POLY. The Oceans 11s Mode button lets the user select up to three variations of many of its reverbs for greater variety. The pedal also features powerful, yet intuitive hidden parameters accessible thru its Secondary Knob Mode that enable the player to take greater control of its effects. The Oceans 11 comes equipped with a standard EHX 9.6DC200mA power supply. Select whether the reverb fades out naturally or stops immediately when the pedal is switched to bypass. Easy access to powerful hidden parameters thru Secondary Knob Mode. Able to produce infinite reverb you can play over in most settings. Comes with a standard EHX 9.6DC 200mA PSU. The item "Electro-Harmonix Oceans 11 Multi Function Reverb Pedal" is in sale since Tuesday, July 10, 2018. This item is in the category "Musical Instruments & Gear\Guitars & Basses\Parts & Accessories\Effects Pedals\Delay, Echo & Reverb". The seller is "theguitarstore" and is located in Seattle, Washington.